Rumor: Next-Generation Lexus LS to Replace V8 with Twin-Turbo V6 Engine? 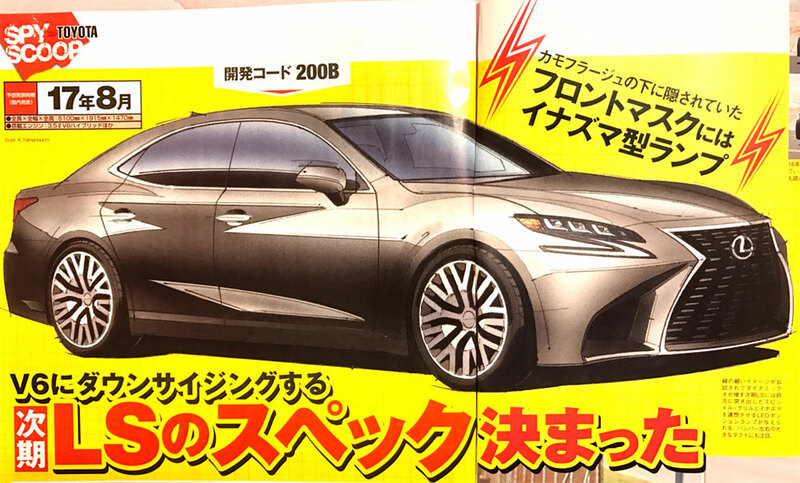 Japanese magazine Mag-X has some insider information on the next-generation Lexus LS in their latest issue, and if true, the Lexus flagship will never be the same again. According to the translation by Lexus Enthusiast member White Beach, the LS will forgo a V8 engine in favor of a twin-turbo 3.5L V6 with 415 horsepower & 442 lb/ft of torque. Mag-X also suggests that fuel economy will be in the 25 miles-per-gallon range. There are other parts to the rumor — the sedan will also be offered at launch with the same 3.5L V6 hybrid powertrain as the upcoming LC 500h, will debut at the Detroit Auto Show in January, and should see a fuel cell version released around 2020. There’s even mention of a possible four-cylinder turbo option further on in the LS lifecycle. Still, removing the V8 as an engine choice is a shocking turn of events for the LS if the rumor is correct — this is a car that has never been offered with anything less than a V8 since its release in 1989, and the potential of customer backlash is a real possibility. At the same time, if a 3.5L twin turbo can achieve the numbers above while maintaining the experience the LS is known for, does the amount of cylinders really matter at all? This is going to be a very interesting rumor to follow — what do you think?